Network Rail (NR) is bringing costs under control but "serious challenges" need to be overcome to improve overall railway management, a report has found. 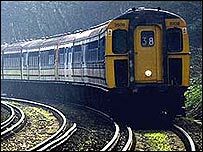 The National Audit Office (NAO) said the way NR - which replaced Railtrack in 2002 - was run was "complex" and its long-term funding costs were unknown. Consistent improvements in punctuality levels would also be hard to achieve, the government spending watchdog said. It urged NR to cut costs further and said its borrowing should be limited. The report said NR, a not-for-profit company set up by the Department of Transport, had achieved significant results in changing the culture it inherited from Railtrack, which was one of "poor risk management and poor value for money". But it warned incentive schemes for managers currently in place did "not always encourage management focus on long-term operational and financial performance". Inappropriate commercial incentives played a large part in Railtrack's problems and should be reviewed, the report said. NAO head Sir John Bourn said: "The improvements to planning and cost control are to be welcomed. "The outlook is certainly better than it was in 2001. "But there are still serious challenges in Network Rail's own structure and in the rail industry in general, which the government must overcome if we are to see a reliable and affordable rail network in the future." Another key issue was that of the shortage of skilled and experienced specialist staff. Railtrack pursued commercial rather than engineering concerns, while NR was focusing on engineering and operating excellence. NAO assistant auditor general Jeremy Colman said: "Skilled and experienced staff have been lost to NR. "NR, and Railtrack before it, have a poor understanding of the state of rail infrastructure. "A lot of that understanding had been built up within the old British Rail and it went when people left. It was in their heads." He said it might be worth introducing some measure that would "nudge" managers towards achieving value for money in the long term. Mr Coleman stressed he was not even "remotely" suggesting the possibility of foul play on the part of senior managers. But he added "the problem of setting incentives or targets over a relatively short term can encourage game playing, where you manipulate results". Overall, the report found there had been significant changes towards simplifying the organisation, reducing management overheads and streamlining decision-making. It said NR was "moving in the right direction" by engaging staff in the change management process and trying to improve morale. The report also suggested an increased collaboration between players in the rail industry could push costs down - an objective which could not be reached by Network Rail alone.